Brixen, Italy – 05/18/2017 – Durst, manufacturer of advanced digital production technologies, announces that Versacolor, a graphic printing company from Sao Paolo/Brasil has just acquired its second Durst Tau 330E. The digital UV inkjet label press provides advantages to customers with the deployment of high pigmented inks and an increased productivity at a very low production costs. According to Fabio Rodrigo Moreno, owner of Versacolor, investments in cutting-edge technology and financial balance are the secrets to remain competitive in a very diversified market, such as in the self-adhesive labels segment. "We always try to follow the evolution of technologies, and we understand that the global trend goes towards digital," said Fabio. "From now on, the self-adhesive segment will demand, more than ever, versatility; It will be necessary to speed up delivery times, to print in high resolution and to use laser finishing." The Tau 330E offers Versacolor the differentiation that the company is looking for, due to the integrated process of digital printing with UV inks, high speed and lower costs compared to other solutions. Fabio also highlights the fact that the Tau 330E printing technology does not require any kind of special treatment on substrates and has an in-line corona system and high-definition print quality. "In addition to these added values, we will have quality and performance with lower costs for consumables," he points out. Targeted for small and medium companies in the label segment, The Tau 330 E prints with up to 5 colors (CMYK + W), a speed of up to 48 linear meters/minute and a resolution of up to 1260 dpi. 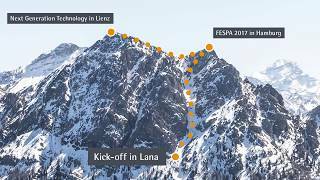 Brixen, Italy – 05/04/2017 – Durst, manufacturer of advanced digital production technologies, will be presenting various aspects of the subject of investment security and reliability at FESPA 2017. In the recent customer survey, “Perspective 2020”, Durst’s customers indicated that, in addition to technological innovation, customer integration has a particular relevance in working together to achieve commercial success. One example of what this type of commercial success can look like is illustrated by the development of roll-to-roll double-sided printing, which is available as a new option for the Rho flatbed printing systems. The starting point for the new feature was the company Eskils. The Swedish full-service printing provider began with large-format digital printing 10 years ago with two Rho 350 followed by two Rho 500, and invested in a Rho 1312 flatbed printing system with roll-printing option in 2015 in order to increase its productivity and expand its portfolio. Eskils’ core business is advertising media for the retail sector, where demand for products with double-sided printing has increased over time. Eskils’ technical director, Lars-Inge Brännmar, therefore faced the challenge of how to produce them 100% justified. As an initial solution, he developed marker points, but the constant manual working steps affected productivity. He imposed his requirement on Durst, and following a joint field test, the system for double-sided printing using sensors was developed into a viable product. The system is now available to all Rho users as an upgrade for the Rho 1312 as well as for the Rho P10 Series. Durst will be presenting new products in its large format printing portfolio in Hall B7, Stand A20, at FESPA Digital 2017. Its trade show presence addresses two core topics. The company will be presenting its commercially successful Rho P10 250 HS Plus and Rho 512R Plus printing systems under the slogan of investment security and reliability; they offer a “plus” in efficiency and versatility with new features and enhancements. Innovation and sustainability are the keywords applied to the new Rhotex 325 and Rho WT 250 printing systems, which open up new market opportunities outside of the UV production portfolio offer thanks to Durst Water Technology. The products are complemented with new service options, including extended warranty periods and new virtual support and analytics functions. Durst will hold a press briefing at its booth on the second day of the trade show – at 10:00 a.m. on May 9, 2017 – to provide in-depth information about the new systems, and will also be available for individual meetings. To arrange an appointment, send an e-mail to press@durst-group.com. Lienz, Österreich - 04.05.2017 - Durst, Hersteller von zukunftsweisenden digitalen Produktionstechnologien, blickt auf einen erfolgreichen Girl’s Day Tirol zurück. Der Girl’s Day ist ein internationaler Aktionstag für Mädchen - "Take your daughters to work" heißt dieser Tag beispielsweise in den USA. Ziel ist es, das eingeschränkte Berufswahlspektrum von Mädchen zu öffnen und neue Perspektiven aufzuzeigen, in der sie ihren vielseitigen Begabungen und Interessen nachgehen können, auch in technischen, handwerklichen und naturwissenschaftlichen Bereichen. In Tirol öffneten am 27. April 2017 deshalb 59 Unternehmen ihre Pforten, um mit Aktionsprogrammen über die verschiedenen Berufsbilder zu informieren. Auch bei der Durst in Lienz, waren 18 Schülerinnen zu Gast und erlebten einen spannenden Vormittag bei dem Hightech-Unternehmen. An 5 Stationen wurden die Arbeitsbereiche in der mechanischen Fertigung, Druckkopf-Montage. Vormontage, Endmontage und im Democenter den Schülerinnen vorgestellt. Als besonderes Highlight, öffnete Durst auch sein Innovationszentrum im „Kristall“-Gebäude und die Mädchen durften Tinten für die Druckmaschinen mischen. Der klassischen Laborarbeit entsprechend, ging es hierbei um Präzision, Konfiguration und Analysen. In der sogenannten „Tintenküche“ fühlten sich die Schülerinnen pudelwohl und das sehr genau und sehr sensible Arbeiten führte zu einer kollektiven Begeisterung. Abgerundet wurde der Vormittag mit einem Quiz, in der das Erlernte noch einmal resümieren werden konnte und einem gemeinsamen Mittagessen mit den Durst Mitarbeitern. Ein gelungener Tag für alle Beteiligten und besonders für die Mädchen, die sich jetzt eine Zukunft in Labormänteln und mit Schutzbrillen vorstellen können. Brixen, Italy – 24/04/2017 – Durst, manufacturer of advanced digital production technologies, will be showing the best of the digital inkjet and conventional worlds, integrated into a single label printing system at Interpack 2017, Düsseldorf, Germany, from 4–10 May 2017. First exhibited as a prototype at LabelExpo Americas 2016, the Durst Tau 330 / OMET XFlex X6 Hybrid System, now combined with Durst’s new Web-To-Print and PrePress Workflow-Label software, will make its European debut on the Durst Booth D73, Hall, 13, Düsseldorf. The integration of the market leading Tau 330 with near-line pre- and post press finishing solutions in cooperation with OMET, the world’s leader in flexographic printing presses, will provide customers with a digital label printing system that is complemented by a wide range of conventional printing and finishing solutions. These include flexo stations for priming and/or varnishing, web cleaning and corona treatment, rotary/semi-rotary die cutting, and slitting. The Tau 330 / OMET XFlex X6 Hybrid System will be shown with Durst’s own production workflow, Durst Workflow-Label, designed specifically for label print production providers. The solution is a modular, expandable pre-press software for order entry, pre-press, RIP, color management, ink costing and production data management. It offers key functionality such as automated knock-out of non-print areas, resulting in lower ink consumption, a high access and self explaining browser-based interface for immediate job costing and easy to use high speed variable data functionality. Brixen, Italy – 12/23/2016 – Durst, the manufacturer of advanced digital production technologies, is unveiling its extensive Alpha Series portfolio with multi-pass inkjet printing systems for the digital production of home textiles and fashion at Heimtextil 2017 in Hall 6 at Stand C16. Depending on what they are used for, Alpha printing systems offer printing widths from 190 to 330 cm and can be configured with up to 8 colors and 64 Alpha-S printheads. With a native resolution of 600 dpi and printing speeds of up to 620 lm/h, they boast 24/7 industrial-scale production capacities, and can be used directly and with tremendous flexibility. The various samples and applications produced by Probo and on display at the trade fair stand will show visitors exactly what these systems can do. In February 2016, the Dutch web-to-print supplier installed a high-performance Alpha 330 inkjet printing in its machine park in Dokkum in order to be able to offer home textiles and accessories alongside its existing soft signage portfolio. The great thing is that clients are able to order their printed items – from yard goods to large volumes – directly in the Probo online website. Orders received by 4:30 p.m. can even be shipped the next day. This efficiency is due not just to the performance of the Alpha Series and digital workflow, but also to the Greentex pigment ink developed by Durst that require no pre- or post-treatment when used with standard materials such as cotton or polyester. This makes the production processes much shorter and considerably more cost-effective regardless of the size of the print run. The Durst Textile Printing team at the trade fair stand will provide information about these and other options for the Alpha Series such as intelligent feeder systems that adapt automatically to the various textile materials and roll circumferences, and will also be on hand to arrange individual appointments. To arrange an appointment, send an e-mail to textile@durst-group.com. Brixen, Italy – 13.04.2017 – Durst, the manufacturer of pioneering digital production technologies, is looking back at a successful presence at the Expo Revestir 2017 trade fair. The Durst Ceramics Printing Segment had its own stand, showcasing its successful Gamma XD 4.0 portfolio to the Brazilian ceramic tile market. The revolutionary digital glaze printing technology, which allows users to develop and manufacture innovative products with an incredible sharpness and richness of detail that have never been seen before, was a real crowd-puller. So too was the unique Durst DM (Digital Material) printing head technology, which allows effect inks to be printed in large quantities (over 100 gsm), and therefore special designs and effects to be created. For this reason, it was no surprise that 4 out of the 10 products nominated for the “Prêmio dos Arquitetos e Designers de Interiores” Revestir Design Award were produced with Durst Gamma XD printing systems. On the Brazilian ceramic tile market, the degree of digitization has now reached 80%, and Revestir 2017 made it clear that the market is consolidating and in the process of focusing more on quality. Tile manufacturers who specialize in mass production with the “Via Seca” production method are seeing new market opportunities and scope for differentiation in the manufacturing of high-quality “Via Umeda” porcelain tiles. Accordingly, the Durst Gamma XD portfolio was the center of attention for over 68,000 trade visitors, since the print quality of the Gamma printing systems is regarded as the standard of reference in tile decoration. With new features for color management and workflow, they also offer further customization and flexibilization options in production. But most importantly, the Gamma XD 4.0 series provides the platform for the future Full Digital Glaze Line, with which Durst created a furor at Technargilla 2016 in Italy. With the Full Digital Glaze Line, Durst is taking tile production to the next level of automation, and synchronizing the glazing, decoration, and final finishing steps to create an end-to-end production process. At Expo Revestir 2017, the Durst Ceramics Printing Segment presented its first sample tiles and attracted attention from all tile producers and competitors. Brixen, Italy – 04/12/2017 – Durst, manufacturer of advanced digital production technologies, will be presenting new products in its large format printing portfolio in Hall B7, Stand A20, at FESPA Digital 2017. Its trade show presence addresses two core topics. The company will be presenting its commercially successful Rho P10 250 HS Plus and Rho 512R Plus printing systems under the slogan of investment security and reliability; they offer a “plus” in productivity and economy with new features and enhancements. The products are complemented by new service options, including extended warranty periods and new virtual support and analytics functions. Innovation and sustainability are the keywords applied to the new Rhotex 325 and Rho WT 250 printing systems that are being showcased. Thanks to Durst Water Technology and economically friendly applications, they open up new market opportunities outside of the UV production portfolio. With the DSR Automatica E, Durst will also be unveiling an initial system in its imaging segment. It is a standalone kiosk system equipped with 120° camera technology, which at the trade show will be integrated into a textile workflow process in order to demonstrate new design and product variations from a range of perspectives ad hoc. Durst will hold a press briefing at its stand on the second day of the trade show – at 10:00 a.m. on May 9, 2017 – to provide in-depth information about the new systems, and will also be available for individual meetings. 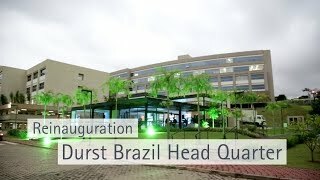 To arrange an appointment, send an e-mail to press@durst-group.com. A new industrial printing system with a print width of 3.2 m for the area of soft signage. 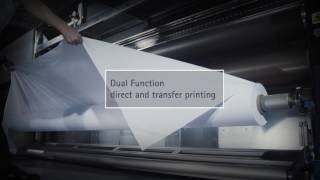 It allows environmentally friendly textile applications based on Durst Water Technology and delivers productivity of up to 390 m2/hour through either direct-to-textile printing or printing on transfer paper. The Rhotex 325 can be equipped with jumbo rolls to handle large print jobs and for unattended production, and also offers remote control and analytics functions to ensure continuous uptime. A new flatbed printing system featuring an uncompromising development of Durst’s Water Technology for environmentally friendly applications on paper media, corrugated boards, and plastics such as acrylic, polycarbonate, and polypropylene. It provides offset printing quality in look and feel and is economically viable from a batch size of 1. A further development of the successful P10 series with 40% greater productivity. It offers an ink-saver function, saving up to 15% of ink as well as an advanced application for hapt printing and roll-to-roll double-sided printing. A further development of the successful 5-meter extra-wide printing system with a new Fine Art printing mode at 1,200 dpi. Productivity is assured universally, even with light and process colors, and its robust design enables unattended 24/7 production. The Rho 512R Plus offers a new V-cut system and requires only minimal maintenance, guaranteeing continuous uptime. Moreover, new additional colors allow even finer color transitions and the faithful production of corporate brand standards. 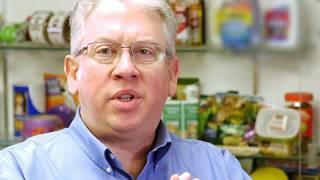 Durst Analytics: A new software solution as a future element of the Durst OS. A preventive service option to guarantee user uptime by monitoring important machine parameters and taking proactive service measures. Extended Service Options: Durst is extending its warranty period for new installations in the LFP segment up to 36 months in combination with newly designed service agreements. Besides machine availability – or uptime – Durst is also addressing “total cost of ownership” as a relevant factor for investment security and commercial success.